Live Roulette in the live casino has different game variations. Among other things, there are automatic Live Roulette variants, but there is also the possibility of playing a Live Immersive Roulette game. Live Immersive Roulette is often played in a separate space and is filmed from different perspectives. For that reason, you will despair in the real-world of the Immersive variant. This will be filmed from three angles. In all cases, the Roulette wheel will appear clearly when the ball is rolling. This perspective is interchanged by a zoomed shot of the live dealer and a shot of the whole picture. 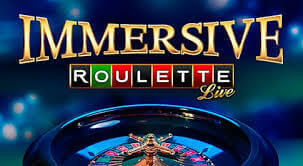 The ability to choose Live Immersive Roulette is unique. The idea is that you experience the game from different angles and it feels if you actually are dragged into the game. This way you will experience live roulette playing completely different from the standard live roulette. Not only is everything visible to your image, it is also possible to follow all steps during the game and to experience the most. The environment during the Live Immersive Roulette has a futuristic look. The background is black with little lights and therefore gives the idea of a starry sky. The quality of the different images that will appear on your screen is extremely high, making it possible to track all the steps while playing. Choose for standard Live Roulette will be the option of 3D view and an Immersive Roulette variant. The idea of the Immersive view option is the same as when you choose Immersive Live Roulette directly. The only difference is that you are now in the live casino where other live dealers are visible in the background. So not in a secluded space. The downside of this variety is that a very small animation of the roulette table will be visible at the bottom of the screen next to the statistics. Both the standard view, 3D view and Immersive view will all take place at the same table. 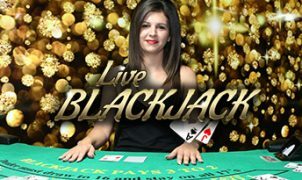 The live features of the live dealers while playing Live Immersive Roulette will also differ slightly from the live dealers during the standard version. It is, of course, even more important that the live dealership takes place during this game variant, as they appear on a regular basis. While playing the futuristic Immersive variant, the live dealer will often be a woman and dressed in a chic blue dress, or in some cases a pink variant. This is often worn with a subtle necklace and lipstick. 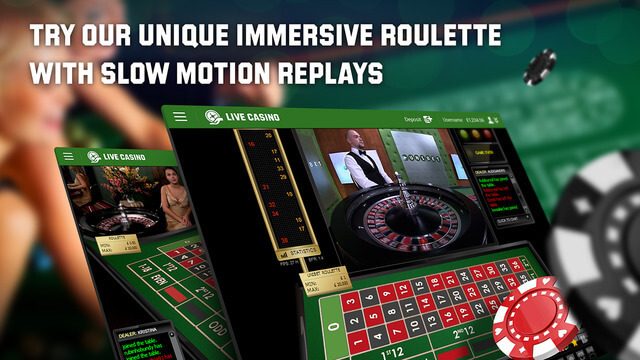 If you choose the Immersive view of the standard Live Roulette variant, you will be at the same dealer at the table as during the standard version. This is dressed in a light dress with purple, shiny details. Evolution Gaming offers different ways to enjoy Live Immersive Roulette. In addition to the specific Live Immersive variant, there is also the option to choose an Immersive view during the standard Live Roulette version. Many online casinos use Evolution Gaming as a live casino software provider. For example, to experience the unique Live Immersive Roulette, choose Rembrandt Casino, 777 Casino or Royal Panda. Start your adventure with £5 for free at Rembrandt!